A LCVP landing craft from USS Samuel Chase (APA-26) approaches “Omaha” Beach on “D-Day”, 6 June 1944. The boat is smoking from a fire that resulted when a German machine gun bullet hit a hand grenade. After discharging his load of troops the boat’s coxwain, Coastguardsman Delba L. Nivens of Amarillo, Texas, assisted by his engineman and bowman, put out the fire and returned to their transport. 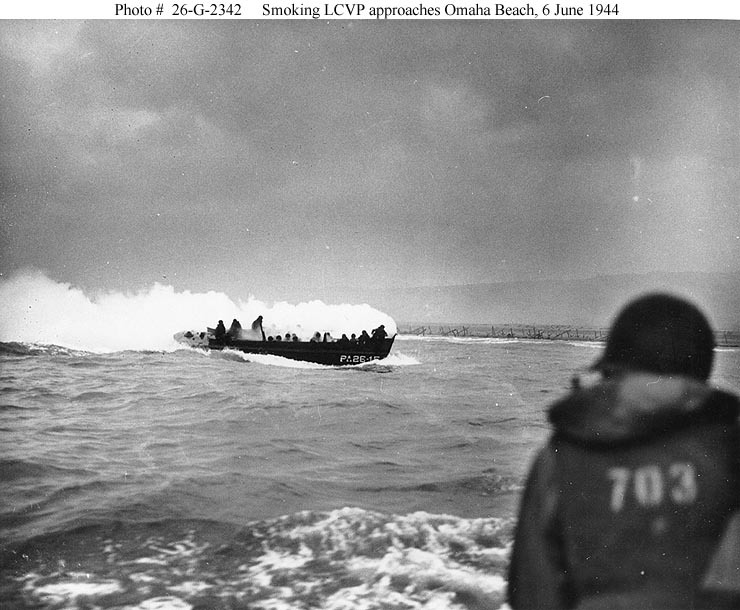 The caption above the photo, “D-Day Smoke Screen” suggests that the crew of this LCVP intentionally “made smoke” in an effort to screen the boat from German gunners. The description below the picture states the smoke was the result of gunfire hitting a hand grenade on the LCVP. it cannot have been caused by both, my best guess is the latter.